Let’s face it, you’re not going to impress anyone with the looks of this soup. It looks like wallpaper paste. Lately, for health and environmental reasons, my husband and I have been leaning more toward vegetarianism. I don’t think we’ll ever go 100% again, but some is certainly better than none. This recipe is vegetarian (and easily adapted to vegan with the parenthetical notes). I made this soup earlier this week with what I had on hand after my last few trips to the Greenmarket. Melt butter. Sauté shallots until translucent. Add leeks and sauté until limp. (Do not let leeks brown.) Add water and bouillon cube, then add potatoes and simmer until tender (about 20-30 minutes). Using an immersion blender, blend until smooth. Turn heat to low and add milk and nutmeg. Stir until both are incorporated. Serves 4-6. This soup tastes like a really exceptional clam chowder — without the clams. The amount of leek I suggested is a wild guess on my part, as I bought freakish monster leeks. 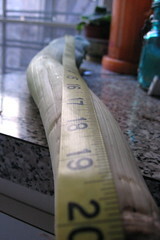 I know the photo is small (you can click it for a better view) but that leek is a good 20″ long and about 5″ around at the base. Using only the white and light green parts of the leek gave me maybe 4 cups of chopped leek. Good thing I really love leeks. Don’t skip the nutmeg! It seemed like an odd addition to me, but it really gives the soup a nutty, spicy note. 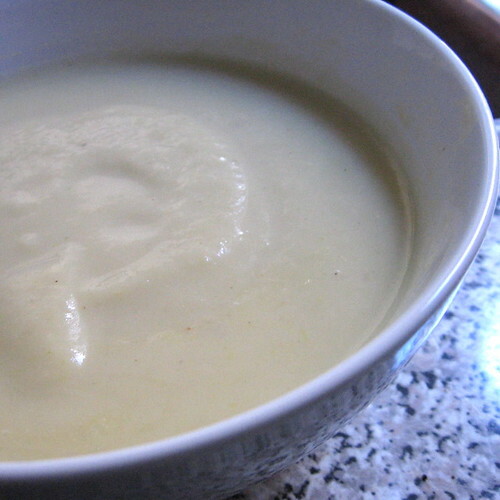 Served cold, the soup is vichyssoise, and one of my favorite summer soups. I love soup. Really, really love it. I should have made soup tonight. Alas, it’s a green thai curry night here. This soup “looks” good. I think I’ll put it on my list of must-make foods. I didn’t know you had been a vegetarian. We used to be as well but my pregnancy turkey craving at Thanksgiving proved too much for me. We are also going back to more veggie meals than meat meals lately for much the same reasons. Yep, Dave and I had been vegetarian (and vegan for about a year) for a long time before a pregnancy craving for — of all things — roast beef did me in. Then, once I had a kid, I started to feel like… there are so many things that divide people in the world; I don’t want to impose one on my kid for the sake of my own beliefs. If she decides at some point, she wants to give up animal products, great. But I don’t really want to make that decision for her. That’s pretty much exactly what we did. And with our already crazy dietary restrictions because of our Celiac Disease we felt it was definitely a decision they would need to make for themselves. Of course, Bailey is the biggest carnivore ever, but Erin hardly ever eats meat at all. She seems to really like ham, but otherwise I make vegetarian versions of just about everything for her (if ours isn’t already). Bailey is the same way. She knows all the details (even the gory ones) and still her response is, “But it’s so yummy!” Erin wanted to know why we have to eat animals and I told her that you don’t have to and that a lot of people don’t eat anything that comes from an animal like cheese or butter or yogurt or even ice cream. Her response was, “Wait! I understand not eating the animal because that’s really gross, but ice cream and yogurt are just, well, good!” I kind of love how honest and matter of fact kids tend to be about these issues.